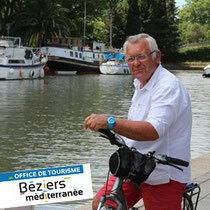 Sign up to meet Jean - Béziers Méditerranée Greeters, un autre tourisme ! Freshly retired, Jean was the manager of a mecanics company. His family has always lived in Béziers and Jean just loves his city. He will take you through the town and its history in a friendly and sporty way, and will adapt the visit to your request. More precisely, Jean a ride on a bike or a walk from the Quai Port Neuf or the 9 Locks on the steps of Paul Riquet, a commented walk in the Poets' garden, up the Allées Paul Riquet, through the Place du Forum, the St Nazaire Cathedral, the Place Canterelle, St Jacques neighborhood and by the Old Bridge.